Anyone with Diabetes, which is not uncommon, affecting some 6% of the population. 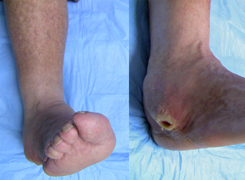 Diabetic foot problems can be severe and inevitably require surgery. People suffering from diabetes generally face 2 problems: nerve damage and poor circulation. These conditions can result in the formation of blisters that can develop into serious and problematic infection within days. Chronic nerve damage (neuropathy) can cause dry and cracked skin, which often allows bacteria to enter and cause infection. This nerve damage in a diabetic patient may lead to the loss of sensation in the feet. Diabetes also damages blood vessels, decreasing the blood flow to the feet. This poor circulation can weaken the bone and result in the disintegration of the bones and joints in the foot and ankle. As a consequence, people with diabetes are at a higher risk for breaking bones in the feet. With the problems associated with nerve damage and limited feeling, a diabetic patient may fracture a bone int he foot and not even realise this. Continuing to walk on the injured foot compounds the problems and more often than not, results in more severe fractures and joint dislocations. The consequences are far and wide ranging, from the requirement for antibiotics to amputation of a toe or foot. For people with diabetes, careful, daily inspection of the feet is essential to overall health and the prevention of damaging foot problems. Swelling of the foot. This can occur without traumatic injury. You are likely to require an x-ray, which will how fractures and dislocations of the joints. The patient shown in the x-ray had noticed swelling of the foot for approximately 3 weeks without any known injury. The x-ray shows several fractures (arrowheads) and a dislocation of the first metatarsal (arrow). This type of traumatic injury is typically seen only after a high-impact event in patients without diabetes. It is possible that you may require an MRI or Ultrasound scan. This will be requested if your Consultant wants to see more details of the soft tissue structures in the foot. In situations whereby your Consultant suspects an infection in the bone, you may be required to undergo a Bone scan (DEXA) /indium scan. The details of this will be discussed at your Consultation. The early stages of Charcot are usually treated with a plaster cast or air boot to protect the foot and ankle. The use of a cast is very effective in reducing the swelling and protecting the bones. Casting requires that the patient does not put weight on the foot until the bones begin to heal. Crutches, a knee-walker device, or a wheelchair are usually necessary and healing can sometimes take 3 months or more. The cast will usually be changed every week or two to make sure that it continues to "fit" the leg as the swelling goes down. After the initial swelling has decreased and the bones begin to fuse back together, a specialised custom walking boot or diabetic shoe may be recommended. The specialised shoe is designed to decrease the risk of ulcers (sores that do not heal). Some diabetics may not be able to wear regular, over-the-counter shoes because they do not fit the deformed foot correctly. Stable deformity. Surgery involves a simple removal of the prominent bone by shaving it off. This may be done either arthroscopically or open. The top x-ray shows that the patient has unstable Charcot of the back of the foot (hindfoot). The dislocation of the joints is seen where the two bones in the back of the foot do not line up (arrowhead). The bottom x-ray shows a complex realignment and fusion was performed to prevent the patient from developing a prominence and ulceration. 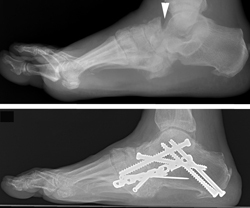 This operation is extremely difficult to perform and carries a higher risk of wound complications, infections, and amputation, compared to routine foot and ankle fracture surgery. After this type of operation, there is typically a period of no weight on the foot for at least 3 months. Placing weight on the foot early and failing to follow your Consultant's instructions will likely lead to complications, such as the return of the deformity or even worsening of the deformity. Ankle deformity. Charcot of the ankle is difficult to treat simply with a brace or shoe and commonly requires surgical fusion of both the ankle and the joint below the ankle (subtalar) to hold the foot straight. Given the amount of destruction of the bone and the poor quality of the soft tissue, the risk that the bone will not heal and the risk of infection are very high. Amputation may be required, either as the first operation or to salvage a fusion that has not healed or has became infected. Trim your toe nails straight across. Avoid cutting the corners. Use a nail file or emery board. If you find an ingrown toenail, see advice from your Consultant. Good medical care is important in preventing infections. Do not use antiseptic solutions, drugstore medications, heating pads, or sharp instruments on your feet. Do not put your feet on radiators or in front of the fireplace. Do NOT smoke. Smoking damages blood vessels and decreases the ability of the body to deliver oxygen. In combination with diabetes, it significantly increases your risk of amputation not only of the feet, but can include the hands, as well.